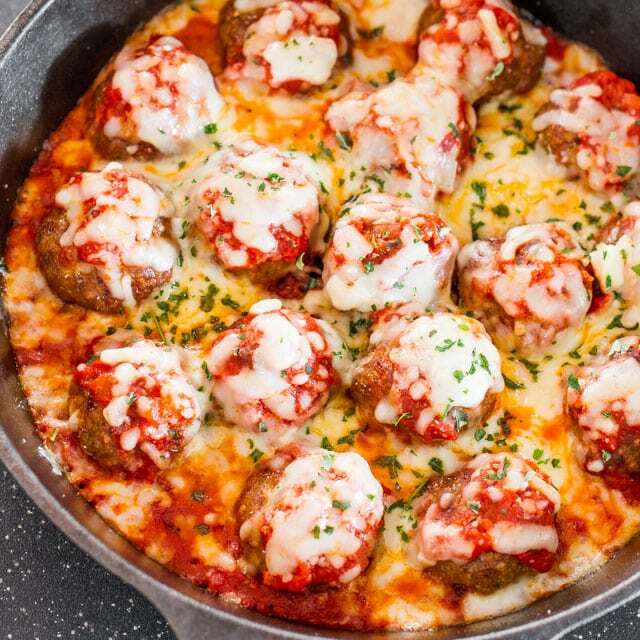 Meatball Parmesan – traditional meatballs smothered in a delicious marinara sauce and topped with Mozzarella and Parmesan cheese. Beautiful and delicious. Meatballs are a staple at our house. I make them often and I make them many different ways. We simply love our meatballs. I decided to make these meatballs with ground pork but ground beef works as well or you can mix the two. As far as the recipe for these meatballs, it’s pretty much my generic meatballs recipe I use all the time, a couple eggs, some breadcrumbs, salt and pepper, an onion and some herbs. You can’t go wrong with meatballs. Since we’ve been on a health kick lately, I baked these meatballs. It seems like whenever we’re on a health kick that’s when all I want to do is bake cakes and make things I cannot/should not eat. How does that make sense? Meatballs are great baked, because most of the fat from the meat is left in the pan and you end up with somewhat lean meatballs. But don’t worry about them being dry or anything, because I smothered them with this beautiful (store bought) marinara sauce I had and a bit of mozzarella cheese and Parmesan cheese. They were moist, full of delicious flavor and were gone just as quickly. We served them with some roasted potatoes and a cabbage salad. Meatball Parmesan - traditional meatballs smothered in a delicious marinara sauce and topped with Mozzarella and Parmesan cheese. Beautiful and delicious. Preheat oven to 375 F degrees. Spray a baking sheet with cooking oil. In a large bowl add ground pork, onion, eggs, breadcrumbs, oregano, basil and season with salt and pepper. Mix everything with your hands and form into 24 big meatballs. There should be enough for 24 meatballs. 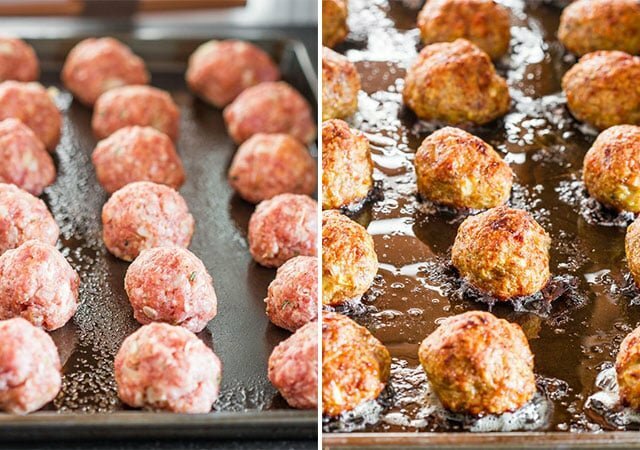 Place meatballs onto the baking sheet and place in the oven. Bake for about 35 to 40 minutes or until meatballs are cooked through. Pour half a cup of marinara sauce onto the bottom of a skillet. Arrange the meatballs in the skillet, they and top each meatball with some of the remaining marinara sauce. Cook on medium heat for about 5 minutes or until sauce is bubbly. 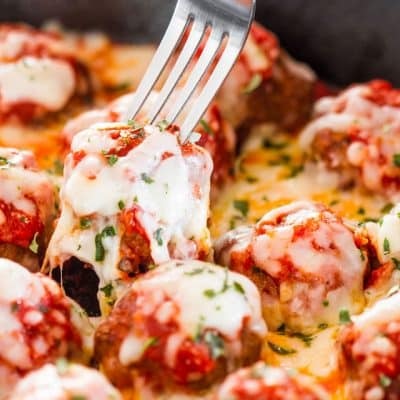 Sprinkle meatballs with mozzarella and Parmesan cheese and place in the oven for another 5 minutes or until the cheese melts. Garnish with some extra basil if preferred. This recipe yields 24 meatballs, nutritional information is per meatball. Can I use any other type of meat: Any ground meat would work. Ground beef would work great as well. You can also combine meats like ground pork and ground beef together. Yes! That’s exactly what I would do. I did this recipes for my family tonight and it was a huge success. HI! I love your recipes and made your chicken shawarma this weekend. SO good! 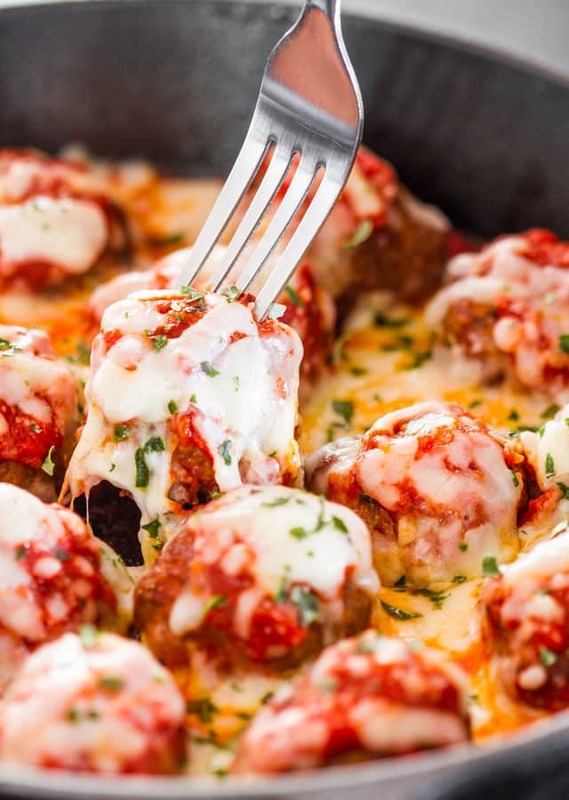 Could you freeze these meatballs and thaw before adding marinara and cheese? Yes, absolutely. Just place them in an airtight container and freeze them. Did you ever post the cake you talked about? If so link or name? Oh dear God, I just went back and read the post and I have no idea what cake I was talking about, but please free to look through my recipes for cakes I have loads of them! I made the meatball parmesan using 1 lb gr pork and 1 lb italian sausage all else the same as your recipe. When it was done made a big loaf of french garlic bread and made meatball subs with it. Delish!!!! Very easy to make. Thank you so much for sharing ;-). Hey sounds great can’t wait to try. Have u ever put the meatballs in a crock pot instead of on the stove top when u do the sauce. And do u think tomato sauce would b ok instead of marinara? Ok. Thank you. God bless! Can frozen meatballs be used instead? I haven’t tried this with frozen meatballs, but I don’t see why not, it’ll save you some time. Man thanks for the recipee! I did substitue the pork for ground turkey! SOO good! Hi! I’m making this for dinner tomorrow…did you just serve it over spaghetti? No, we served them with some roasted potatoes and a green salad, but spaghetti would work just as well. My hubs is a huge meatball advocate. I’m not a big spaghetti person and that’s usually the only way I serve them. 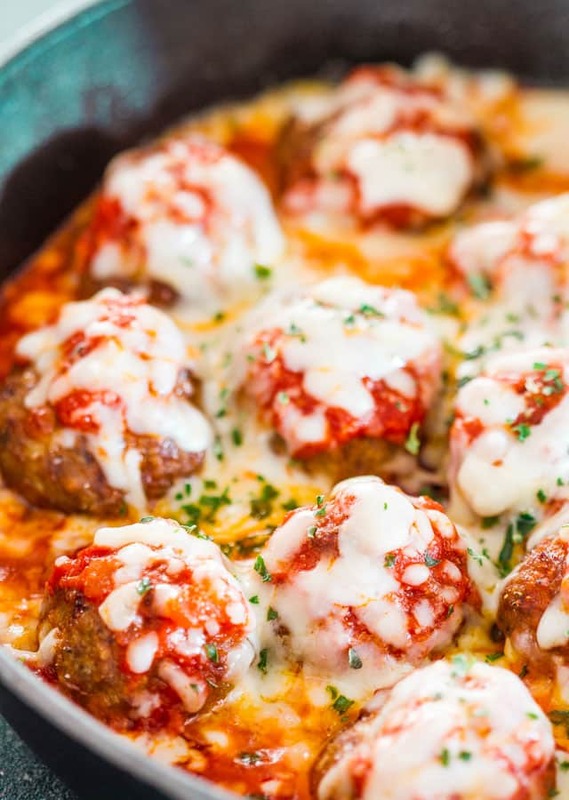 Love this idea of a meatball parmesan! I had to comment on this post. You baked them for 45 meatballs…lol. I love your photography and recipes and, hopefully, your sense of humor!